The Audio Department of Perfecting Church is responsible for having quality sound at all events in and pertaining to Perfecting Church. Inclusive of Audio's responsibilities is the recording of all sermons, both audio and video, which are available for purchase in the bookstore. This department also provides sound for all services and special events such as Convocation, weddings & special events. The Catering Department is a department that handles all food functions for the church. This department is comprised of experienced chefs as well as homemakers, teenagers, and anyone who is willing to learn the art of fine cooking. While experience is well appreciated, it is not mandatory. The staff of the Catering Department is more than willing to train and cultivate anyone to reach their greatest potential in this department. The Children's Church is responsible for the spiritual growth and edification of all children ages 4 to 11. This is accomplished through weekly Children's Church services and special events that showcase our children. The Children's Department staff does not teach them to imitate adults, but rather the principles and the importance of living a holy and sanctified life by accepting Jesus at an early age. The Dorcas Society is a department that is responsible for tending to the needs of the Pastor, guest ministers, and those serving during worship services. They are responsible for all elements to ensure the comfort of the above noted and to provide any assistance when needed. Dorcas is also responsible for preparation/assistance of Communion, Feet Washing and Baptism Services. The Drama Department of Perfecting Church exposes the congregation and visitors to the arts with theatrical productions, illustrated sermons, vignettes, as well as dance. The Drama Department also train members in all aspects of the arts i.e., acting, costumes, make-up, etc. The Education Department of Perfecting Church promotes and motivates students from kindergarten to college. The Education Department provides scholarships, weekly tutoring, workshops on financial aid, how to select a college, how to fill out applications for college, etc. This department also helps students find monies needed to continue their education and helpful advice on all aspects of obtaining a quality education. The Evangelism Department is a very vital department within the ministry. As our Pastor constantly reminds us, it is the "heartbeat" of the church. The Evangelism Department's responsibility is to witness to those who may not attend regular church services. It is their job to spread the word through street, jail & school ministry, hospitals and convalescent homes, and any place where they can be an effective witness. "For if we cease to evangelize, we will eventually die". The Follow Up Department is a department that works with Evangelism. Follow Up is responsible for recording all information from new converts, and tracking them with regular phone calls to ensure that they are growing in the grace and knowledge of the Lord Jesus Christ. Each department is established with individual requirements and criteria. (Auditions are required for the Perfected Praise Choir). The Health & Fitness department is dedicated to the preservation, education and health & wellness for both the members of Perfecting Church and community. The Health & Fitness department offers fitness classes, health screenings throughout the year and weekly community basketball. The Health & Fitness department is also responsible for the activities at the annual church picnic; they also play a vital part in the planning of the "Ron Winans - Heart of a Champion 5K". The job of Perfecting Church's Hospitality Department is to make sure that everyone feels warmly welcomed at Perfecting Church whether you are a member or visitor. Hospitality visits the sick and shut-in, greets you every week as you visit Sunday & special services, records all information for new members, assists in New Member Orientations, and any other member or visitor services to ensure a pleasant and harmonious atmosphere at Perfecting Church. The Media Department is responsible for the bookstore of Perfecting Church. Media handles the duplicating of weekly services, audio and videotape catalogs, processing mail orders, and stocking the bookstore with the finest selection of Christian literature, music tapes and any other specialty items. 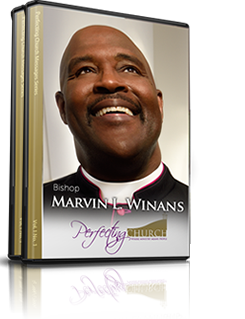 Perfecting Church's "Best Man Ministries" as a department strives to be far above and beyond any other Men's Department. Their main objective is to lead by example. This department hosts annual Men's Weekend & other functions to encourage brotherhood and unity. The Ministerial Alliance Department was established to serve as a school of ministry for those who have the call of God to preach and teach the gospel of the Lord Jesus Christ under the ministry of Perfecting Church. As members of this elect alliance, ministers are required to attend monthly meetings, in which they receive training on all aspects of ministry, instruction in sermon preparation, and assignment schedules for weekly church services. The Ministerial Alliance Department is also responsible for visiting the sick, convalescent, and bereaved families. The bible instructs the "older women to teach the young women in things of the Lord". Our church mothers are precious, having a wealth of knowledge. The Mother's Board is in constant prayer for our church and leadership. They are holy women and teach our ladies to be better wives, mothers and women by example. The Nursery Department is responsible for attending to all children from newborn to 3 years of age during service times. The Nursery Department staff consists of caring, patient individuals who carefully watch infants so parents may enjoy service without distraction. The Perfecting Care Department's mission is to reach out to the poor, destitute and those experiencing unexpected crisis by supplying food, clothing, housing and community resources and referrals. Members are committed to serving at the Perfecting Care Community Center throughout the week by providing vital human services to church members and those throughout the metropolitan Detroit area, ultimately empowering them to be self-reliant. Perfecting Overcomers Outreach is ministry that services both the church and community. The mission of the department is to offer recovery through the power of Jesus Christ by promoting the biblical pattern for overcoming strongholds through the Holy Spirit and word of God. Sharing sessions are held monthly, offering bible lessons, prayer, support and encouragement to live a victorious life! The Perfecting Overcomers also provide recovery outreach services, community chaplaincy care, literature and support groups. The Political Relations department is comprised of individuals who have a strong interest in the areas of community and political relations. This department reviews, researches, and educates the congregation on various related issues and acts as a voice in the community regarding political issues and concerns. The Public Relations Department spotlights Perfecting Church in the most professional and positive light within the city of Detroit, the country, and throughout the world. It is the role of this department to make sure that Perfecting Church is involved with the community by offering help to various community organizations. Public Relations also produces Perfecting Church's "Remnant" quarterly magazine and is also responsible for press releases from our church as well as our Voice of Hospitality. The Security Department of Perfecting Church maintains safety for all members and visitors while attending services. The Security Department patrols the parking lot and surrounding streets to ensure safety. The Security Department also monitors all activities during service and is responsible for securing of the church building after each service. The Transportation Department provides weekly van services to anyone in need of transportation to church services. In addition to weekly service transportation, this department works with all departments in need of transportation and various church functions. The responsibility of the Usher is to greet everyone with a pleasant smile, maintain crowd control, and to assist in the receiving of tithes and offerings. This department works with the Security Department in monitoring the corridor and restrooms. The Usher Board also distributes bulletins and visitor cards. The women of Perfecting Church are a dedicated group of wonderful women, desiring to do the will of God. Once joining Perfecting Church, enrollment in this department is automatic for every woman. The Women's Department meets on a regular basis to encourage sisterhood and unity. The department also host annual Women's Weekend. The "C4" Youth Department is responsible for all youth between the ages of 12 to 20. To ensure that we lose none of our youth to the wiles of society, the "C4" Youth Department plans activities for the young people to keep them active in the church while teaching them Christian values. C4 conducts youth services every week and annual Youth Weekend.